proximate cause of a serious bodily injury to another, such person commits vehicular assault. This is a strict liability crime. any inhaled glue, aerosol, or other toxic vapor or vapors, as defined in section 18-18-412.
against any charge of violating this subsection (1). 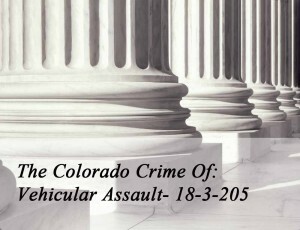 (c) Vehicular assault, in violation of paragraph (a) of this subsection (1), is a class 5 felony. Vehicular assault, in violation of paragraph (b) of this subsection (1), is a class 4 felony. shall be presumed that the defendant was not under the influence of alcohol. evidence in determining whether or not the defendant was under the influence of alcohol. of whether or not the defendant was under the influence of alcohol. of any test or tests of the person’s blood, breath, saliva, or urine for the purpose of determining the alcoholic or drug content within his or her system. The type of test or tests shall be determined by the law enforcement officer requiring the test or tests. shall be subject to license revocation pursuant to the provisions of section 42-2-126, C.R.S. noncooperation shall be considered a refusal to submit to testing. amounts of chemicals contained in such kit. authorization to obtain blood specimens is not a prerequisite to the admissibility of test results concerning the blood specimens obtained. No civil liability shall attach to a person authorized to obtain blood, breath, saliva, or urine specimens or to a hospital, clinic, or association in or for which the specimens are obtained in accordance with this subsection (4) as a result of the act of obtaining the specimens from any person if the specimens were obtained according to the rules prescribed by the state board of health; except that the provision does not relieve the person from liability for negligence in obtaining the specimen sample. to take, or to complete, or to cooperate with the completing of any test or tests. 42-4-1301 (1) or (2), C.R.S. defendant from offering evidence concerning the accuracy of testing devices. 5. such conduct was the proximate cause of serious bodily injury to another person. 5. and such conduct was the proximate cause of serious bodily injury to another person.